This Post Contains Spoilers for the Upcoming Guardians of the Galaxy! With all of the attention surrounding the Avengers franchise in the last few days, Marvel wanted to make sure the world didn’t forget that they have another team of superheroes hitting screens in just a couple of weeks. And the way they chose to go about that was by revealing a cast list that let some of the most exciting, buzzed about and truly bizarre cameos in Guardians of the Galaxy slip to the entire Internet. 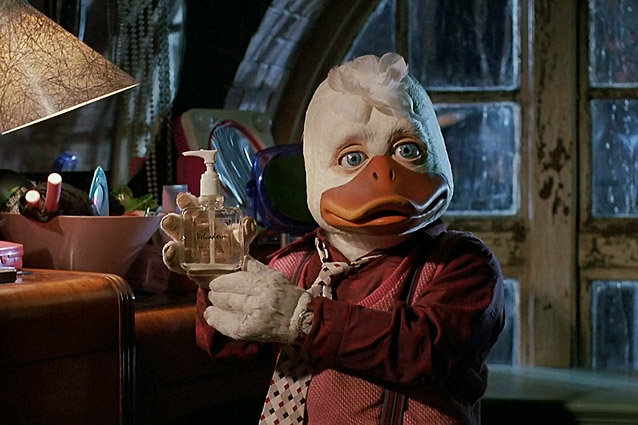 According to Stitch Kingdom, cult favorite Nathan Fillion will be appearing as “Monstrous Inmate,” – which is a bit of a letdown, considering the amount of press his cameos has generated over the past few months – Stan Lee will play “Xandarian Ladies Man,” and Howard the Duck will be making an appearance as himself. The union of the five-time NBA All-Star and two-time Hall of Famer and the giant mutant lizard that has been known to both spit fire and shoot lasers from his eyes was originally conceived as a Nike ad, and later expanded into a comic book. Because nothing says “cool sneakers” like a basketball-playing kaiju that can’t actually fit his giant feet into shoes. Also, who was buying that comic book? There was once a time when you hadn’t properly made it until your cartoon got its own comic book. Unfortunately, some shows just aren’t meant to be read, and Ren & Stimpy is one of them, so when the comic book (unsurprisingly) failed to sell, they brought in the big guns: Spider Man. In true Ren & Stimpy fashion, Spidey took on Powdered Toast Man, that beloved vigilante superhero/breakfast food spokesman. If you’ve ever wanted to know what it was like to read a 12-year-old’s fever dream, this is the comic for you. Spider-Man isn’t the only superhero to succumb to some very obvious product placement. Superman one teamed up with the Quik Bunny, purveyor of powder that makes your milk brown, in order to fight the Weather Man, a lame villain with fourth-tier powers and a costume that made him look like he was starring in a community theater production of Robin Hood. At least Spider-Man had the dignity of fighting with a fictional breakfast-hero. Remember the Super Mario Bros. Super Show!? No? Well, that’s probably for the best, but it does mean that you missed seeing Inspector Gadget, the world’s more over-equipped and incompetent detective, get his various malfunctioning parts fixed by Mario and Luigi, who are supposed to be plumbers. You probably wouldn’t be surprised to find out that it goes horribly wrong, to no-doubt hilarious consequences. Clearly, the moral of this episode was to play to your strengths, and maybe not to call a plumber to fix a wire problem. On some level, this one probably makes some sense. 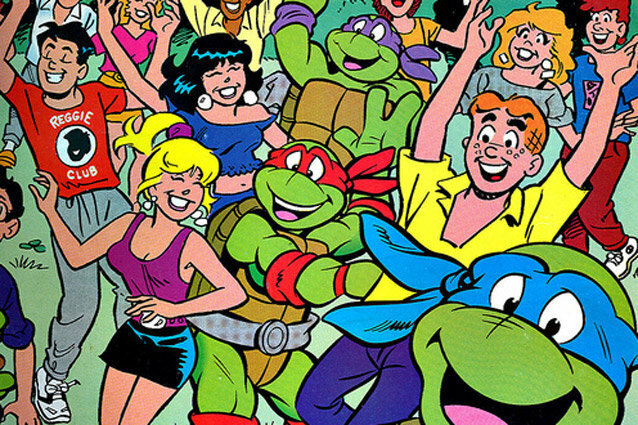 After all, Archie and his friends are teenagers, and so are the Ninja Turtles. Both groups like pizza and video games and, from the looks of the cover, dance parties. But what’s really strange about this crossover is that it happened as the result of the Turtles being spit out by a giant cow head, which apparently allowed them to hop through various dimensions. Mutant ninja turtles or no, there had to be an easier way to get these guys to Riverdale. In what is perhaps the most well-meaning, mild-mannered crossover of all time, Mr. Rogers appeared on an episode of Arthur that centered around Arthur being embarrassed that the friendliest man on television was going to be staying at his house. Of course, this conflict is solved with a charming heart-to-heart that taught children that real friends don’t make fun of their friends for what they like. Unless that thing is Transformers. Not even Mr. Rogers can endorse Michael Bay. You know who’s really into comic books and superheroes? The kind of people who religiously watch daytime soap operas – we’re assuming that was the pitch that got Guiding Light to team up with Marvel on a crossover episode that saw soccer mom Harley Davidson Cooper gain superpowers after being struck by lightning on Halloween night and transform into Guiding Light. (Seriously.) The saddest part of this is that Marvel clearly didn’t learn anything from their failed experiment at reaching a new audience, since they had the Thor announcement revealed on The View. When it comes to crime-fighting teams, there are two that stand above everyone else: Batman and Robin and the Mystery Gang. So teaming them up on The New Scooby Doo Movies to uncover a hooded counterfeiter who’s been sending the Penguin and the Joker fake money makes perfect sense, right? Sure, if you live in a world where Mrs. Baker is on the same level of super villainy as two of the most iconic comic book villains of all time. Fun fact: this episode was so poorly received that Batman later made fun of it in an episode of his own. The plot of this movie sees cartoon favorites like Winnie the Pooh, Alvin and the Chipmunks, the Muppet Babies, the Looney Toons, and the Smurfs come to life in order to convince Michael to stop smoking pot, drinking, and stealing from his sister’s piggy bank for drug money. Because if anything is going to convince someone to stop doing drugs, it’s a bunch of cartoon characters who suddenly come to life and sing songs about life choices. Clearly, all D.A.R.E. really needed to be effective was Daffy Duck.